The three main protagonists of this anime. Today’s post marks the start of the audition searching for this blog’s ‘Anime of the Year 2012’ inaugural winner. 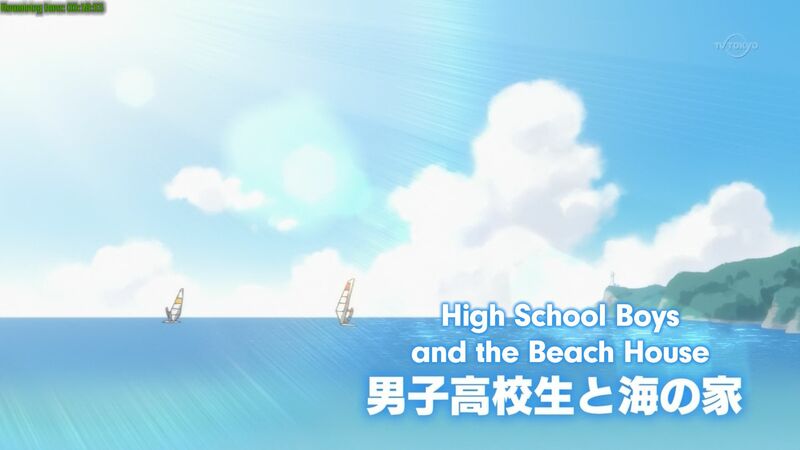 Actually, I want to only start this audition once the 2012 spring season ends, but because I cannot wait to watch Daily Lives of High School Boys for reasons that will be detailed below, I started the audition early. Because of this, there are only four titles in the audition, and they are Nisemonogatari, Papa no Iu Koto wo Kikinasai!, Another and of course, Daily Lives of High School Boys that will be reviewed today. A beach episode. Obviously it is nowhere as good as the outstanding Highschool of the Dead OVA. The two main protagonists, alongside a secondary character sidekick, are 2nd year students in a normal all-boys high school somewhere in Japan. Permanently trapped in that class ala Urusei Yatsura, the three characters does their daily own stuff in and outside the school, between each other, between them and their own schoolmates, plus their own families and students from other schools too. This plot-less comedy anime is suspiciously similar to another anime that involves plenty of high school boys, titled Sakigake!! Cromartie Koukou a.k.a Cromartie High School. Both of them are comedies and features male high school students, mostly in high school settings. Don’t even bother trying to find anything that resembles plot in here, this anime is one of those titles that that are purely driven by character strengths and the humor. The comedy in this anime is great, just like what you can see in Cromartie Koukou. But if those two’s comedies quality are compared, I think Cromartie Koukou will still edge ahead of this anime in this regard. Just like Cromartie Koukou, this anime is also a dialogue-heavy anime, but this anime has the distinction of having far more action in it. Just so you know, Cromartie Koukou is set up at a delinquent-only all-boys high school, yet that anime has almost zero violence in it. 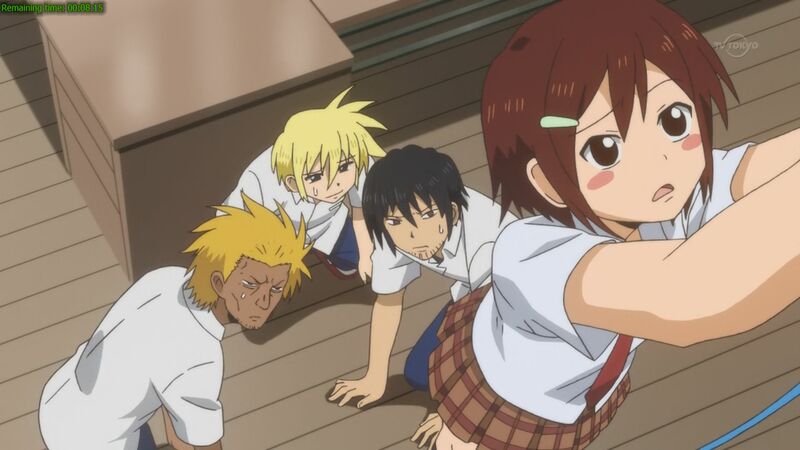 In this anime, set up at a normal all-boys high school, punching people as a response of being at the wrong end of a joke is a very common event in this anime. 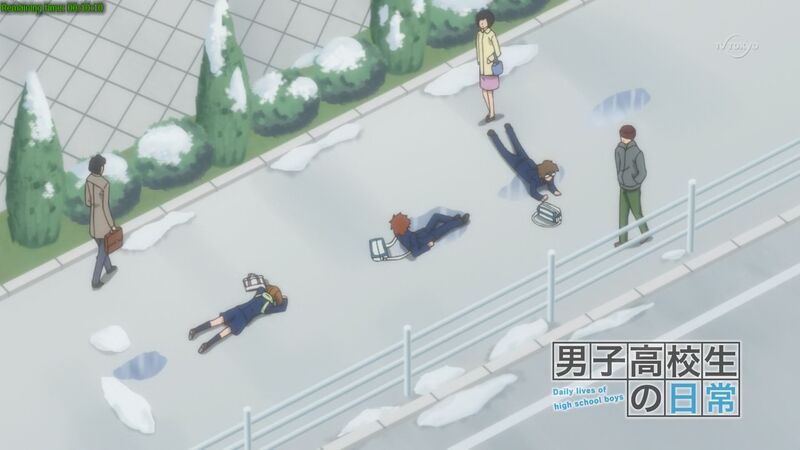 The ending of one of the best comedy arcs in this anime. The three main protagonists and the best characters in this series, all of them MALE high school students, are central elements of this anime, after all they have the most airtime and are involved in almost all arcs in this anime. The central main protagonist (the one at the center in the top-most screenshot above) has his airtime cut severely in the final third of the anime, and that’s why I downgraded him to the sidekick status in the synopsis in the first paragraph above. Due to the nature of this anime, character developments in this anime is almost non-existent, with almost all of the characters in this anime is virtually the same between the start and the last episode. 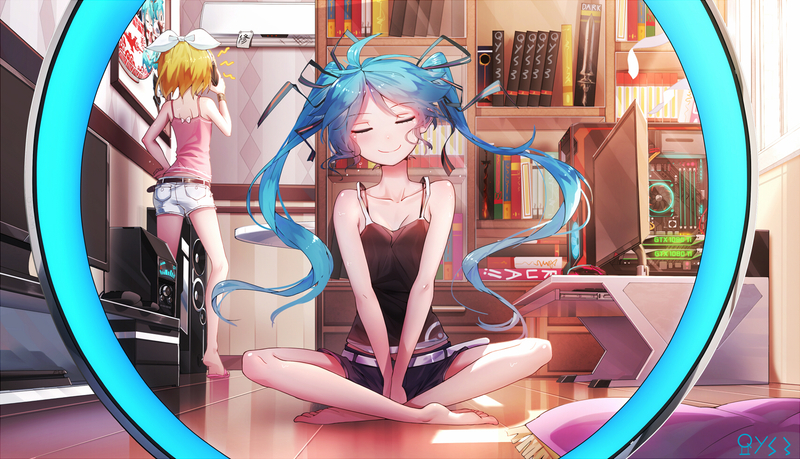 The three characters are also backed up by many good secondary characters, from the high school itself or from within the characters’ households. Even the aforementioned recurring female characters has done well, most of them anyway like the ‘High School Girls Are Funky’ characters and also the student council president from the all-girls high school. This side show at the end of each episode is quite good too, it managed to give the main series a run for its money. 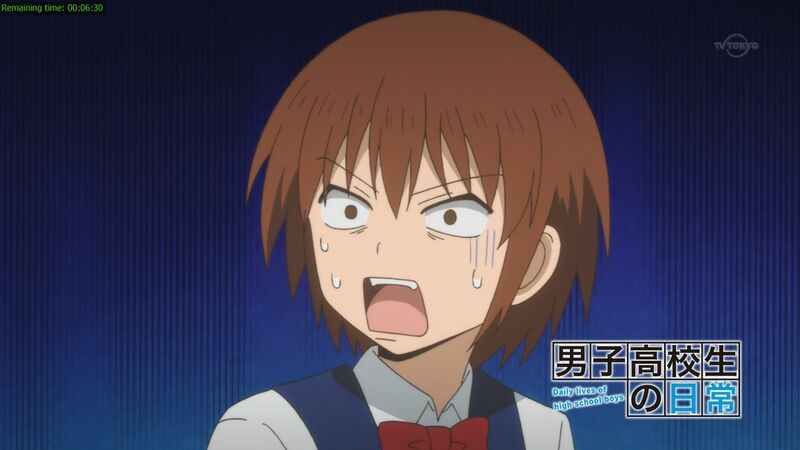 This anime has the Azumanga Daioh’s storytelling method, where each episodes contained small arcs that is several minutes long. Therefore the pacing is fast just like what you can see in Seitokai Yakuindomo that uses the 4-koma manga storytelling method in its anime version. This anime minimized the negative effects of using such a storytelling method by not only keeping arcs in the same themes together more often than Seitokai Yakuindomo is, arc pairing method is also used where one given arc will be followed by another arc that will use the context from the previous one. It also helps that the arcs in this anime is longer too than the ones in Seitokai Yakuindomo. Transitions between distinct arcs are largely seamless too but not perfect, considering the storytelling method this used. The ending is open-ended, setting up nicely for a second season. The only drawback about the ending is that the arc is one of the weakest arcs in the whole series, mainly because the anime tried to step out of its comedy genre and having some melodramatic scenes in it. Somehow, the way the last episode being presented reminds me of Hayate no Gotoku. When was the last time I’ve seen a last episode that isn’t one? 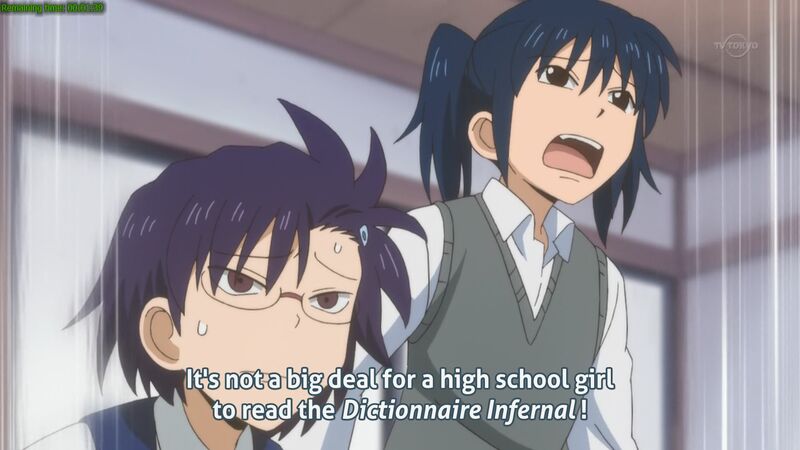 Just one of the humor in this anime, that is not possible at all in the likes of Cromartie Koukou. Definitely different from what you can see in Cromartie Koukou for sure. In Cromartie Koukou, 95% of the characters has that ‘wild’ looks that makes little kids cry, while only 5% of the characters in this anime has it. And to think that violence is more common in the latter. In general, character designs in this anime is is much typical for a shounen though. There is implicit acknowledgement that hair dyes are used by characters in this anime so I’ll overlook all of those blond and yellow-haired and purple-haired characters. Not bad but not outstanding either. The quality of voice acting in this anime is grossly uneven. Amongst the three main protagonists, one of them (the bespectacled guy) has done an excellent job, another one (the central protagonist turned sidekick) is mostly decent while the blonde guy is just barely above average. As for their schoolmates, their families and also the female characters, the quality also vary widely. 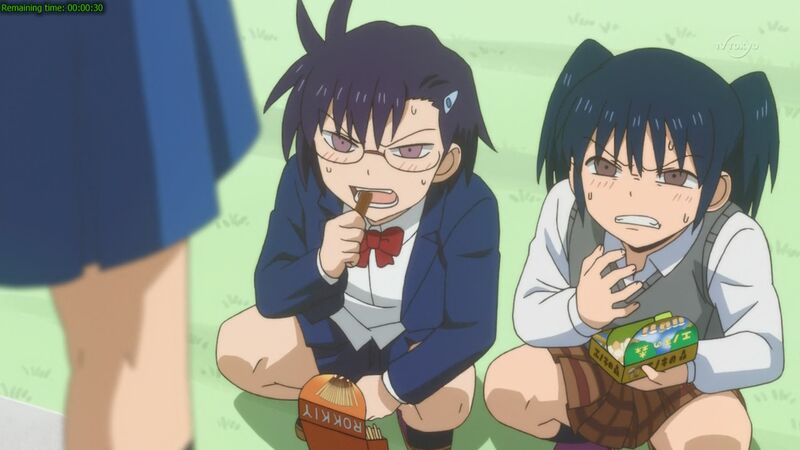 The two student council presidents, the bearded guy from the main protagonists’ class and his older sister, and the bespectacled girl and the Archdemon from the ‘High School Girls Are Funky’ skits also has excellent voice acting gigs. Want to know how those three characters ends up on the ground? Watch this series then! This anime has also done pretty well in this aspect. The OST is decent, but too sparse for my liking. If the dialogue-heavy Seitokai Yakuindomo can have a great soundtrack, I don’t really see this anime that has similar presentation cannot have it. The ED theme is below average, but the OP theme and the insert in 3rd episode are quite good. This anime used the blurry animation technique here (just like in Sunrise’s Sacred Seven), usually in slow-paced scenes, the reverse of the application seen in Cardfight!! Vanguard. A point will be deducted from the final evaluation then. Apart from that, the animation quality is not exactly good, especially in laid-back slow-paced scenes. Compared to the recent two Sunrise titles reviewed here before, Sacred Seven and Tiger & Bunny, the inferiority of the animation quality here is really apparent. Despite the delicious amount of violence in this anime, choreography doesn’t really apply to this comedy title. The director has done a good job too, especially for minimizing the negative effects of this anime’s storytelling technique.